Russia's population is shrinking dramatically as not many find it practical to have big families. It's time for concrete steps to avert a demographic disaster. The demographic crisis in Russia is getting alarming by the day. At the beginning of the 21st century, depopulation in Russia amounted to almost 700,000 people per annum. If nothing is done to check this downslide, the Russian population is set to plummet from 143 to 107 million people by 2050. In his campaign, Vladimir Putin, who has won the polls by a resounding majority, promised an efficient strategy to increase the population to 154 million. “The historical price of choice between action and passiveness is almost 50 million human lives for the next 40 years,” said Putin. However, Valery Elizarov of the Centre of demographic research, Moscow State University, is not convinced. “For the timeframe till 2050, it’s possible to give well-grounded forecasts only of reducing the speed of depopulation and not of population growth,” he says. Young people in Russia are sceptical about the government’s family support policies. They are unhappy with the lack of decent accommodation, awfully small “maternity capital” and the money paid for the duration of the pregnancy leave. Moreover, there is a dearth of facilities for children such as kindergartens and hobby groups for kids. "Today, either people have children when they are very young and reckless, and don’t realise what bringing up kids actually means. Or many others prefer to have kids at the more mature age, after 30, when both parents have successful careers and have saved enough money,” says the 28-year-old Ekaterina, a mother of a five-year-old son. “Accommodation is a big deal,” rues Ekatrina. “The government advises us: take a real estate loan. And it sounds like a good idea! But there’s a catch. Paying out a real estate loan and providing for a childe takes a heavy financial toll on a family." The government’s initiatives such as the “Young family” programme, which enables young couples to take a real estate loan on favourable terms with a lower interest rate, are hardly an incentive to have a child, not to mention two or more children. “I received my maternity capital, about 37,000 rubles (a little more than $1000), which seemed like a considerable sum at first,” recalls the 27-year-old Maria who has a two-year-old daughter. “But all I could buy for this money was a pram and crib for my baby. And raising a child means a lot of expenses. Now, I spend on an average of about 12,000 rubles a month (about $400) just on basic needs: food, clothes, shoes." And it’s not just financial issues. The dilemma of combining motherhood with a career or studying is very acute for women. In the Soviet times, there were more ways for women to have children without sacrificing their work, with a variety of services and facilities for women with kids such as day-care units or afterschool for children with working parents. Now, the number of such facilities has reduced, and the quality of care leaves much to be desired. “If you’re a full-time mum, you can handle it. But because of my PhD, I have to hire a nanny for my two-year-old daughter for several hours a day. And a good nanny is hard to find. They prefer to work on a full-time basis, which would cost around 40,000 rubles (more than $1,000). " There are some families who choose to have three or more children. But they are exceptions. There are many middle-class 20-plus Russians, with higher education and successful careers, who don’t want to have even one or two kids. The study by the Institute of demographic research published in the "Demographic research" magazine in September, 2011 analyses the main reasons for the decrease in birth rate in Russia (see the chart). Experts are arguing that solely appealing to a return to traditional Russian family values is not enough. 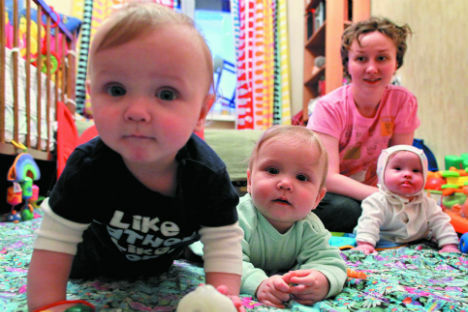 It’s time to take concrete measures to boost Russians’ motivation to have kids, they say. Youri Kroupnov of Russian Institute of Demography, Migration and Regional Development, is convinced that a quarter of profits from selling raw materials must go directly to the special Foundation of Future – to the individual account of every Russian child aged 0 to 25 years, and up to 30,000 rubles can be spent annually for supporting families with kids. Roman Mogilevsky, scientific leader of the “Agency of Social Information”, points out that if the mother’s capital is not enough, then the government must work hard and search for new ways of increasing the birth rate in the country.